White is a signature color of luxurious style, and this Apples of Gold white topaz ring is no exception. This solitaire gemstone ring offers the radiance of a white topaz gem as the crowning glory of this piece. Measuring 6mm, 7mm or 8mm, the white topaz stone is given a round cut for optimal brilliance and shine. The four-prong setting keeps the lovely stone secure and in style, while the band of clean white silver forms the perfect foundation for this luxurious creation. 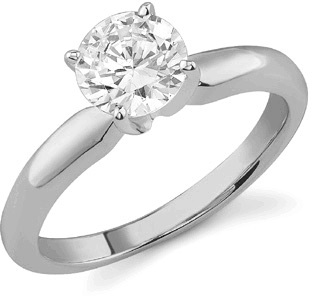 We guarantee our White Topaz Solitaire Ring in Sterling Silver to be high quality, authentic jewelry, as described above.